There is a dedicated forum for discussion on this topic. The Three Gorges Dam (Simplified Chinese: 三峡大坝; Traditional Chinese: 三峽大壩; Pinyin: Sānxiá Dàbà) (30.827° N 111.000° E) spans the Yangtze River at Sandouping, Yichang, Hubei province, China. Construction began in 1993. It is the largest hydroelectric dam in the world, more than five times the size of the Hoover Dam. The reservoir began filling on June 1, 2003, and will occupy the present position of the scenic Three Gorges area, between the cities of Yichang, Hubei; and Fuling, Chongqing Municipality. Structural work was finished on May 20, 2006, nine months ahead of schedule. However, several generators still have to be installed; the dam is expected to become fully operational in 2008. The Three Gorges Dam Project is quite likely the most expensive, extensive engineering project the world has ever seen. Many compare the scale to that of The Great Wall in terms of expense, scale, manpower and benefit. Many still see it as a useless, colossal mistake, whose benefits are overshadowed by the detriment to the environment, culture, history, aesthetic appeal and archaeological resources of the region. This Special Report seeks to provide both sides of the matter so that the objective reader may determine which is greater- the cost or the benefit. Till a smooth lake rises in the narrow gorges. This may not have been the beginning of the Three Gorges Dam Project as we know it today, but it is one of many references to such a structure made several times over the course of modern Chinese history. The first proposal to such a structure dates back to 1919. Dr Sun Yat-sen, then leader of China's ruling party, the nationalist Kuomintang, for the purpose of power generation and flood control. This initial proposal was elevated by the National Defense Planning Commission when they made a survey of the proposed site in 1932. Due to unfavorable political and economic conditions, the idea was deserted. Major floods along the Yangtze river resurrected the idea and the Chinese government, now the People's Republic, adopted it in 1954 for flood control. Vice Minister of Electric Power Li Rui initially argued that the dam should be multipurpose, that smaller dams should be built first until China could afford such a costly project, and that construction should proceed in stages to allow time to solve technical problems, according to Chinese scholars Kenneth Lieberthal and Michel Oksenberg. Later, Li Rui concluded that the dam should not be built at all since it would be too costly, flood many cities and fertile farmland, subject the middle and lower reaches of the river to catastrophic flooding during construction, and would not contribute much to shipping. Sichuan province officials also objected to the construction since Sichuan, located upstream, would shoulder most of the costs while downstream Hubei province would receive most of the benefits. Lin Yishan, head of the Yangtze Valley Planning Office, who was in charge of the project, favored the dam construction, however. His optimism about resolving technical problems was further encouraged in 1958 by the favorable political climate and the support from the late chairman Mao Zedong, who wanted China to have the largest hydroelectric dam in the world, according to Lieberthal and Oksenberg. Criticisms were suppressed. But depression resulted from the disastrous Great Leap Forward and ended the preparation work in 1960. The idea resurfaced in 1963 as part of the new policies to build a "third front" of industry in southwest China. But the Cultural Revolution erupted in 1966, and in 1969 the fear that the dam would be sabotaged by the Soviet Union, now an enemy, resulted in a construction delay. 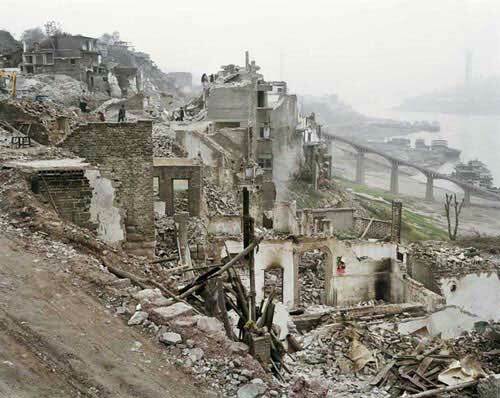 In 1970, work was resumed on Gezhouba, a smaller dam downstream, but it soon ran into severe technical problems and cost overruns that seemed likely to plague the Three Gorges Dam on an even larger scale. The economic reforms introduced in 1978 underlined the need for more electric power to supply a growing industrial base, so the State Council approved the construction in 1979. A feasibility study was conducted in 1982 to 1983 to appease the increasing number of critics, who complained that the project did not adequately address technical, social, or environmental issues. Further feasibility studies were then conducted from 1985 to 1988 by Canadian International Project Managers Yangtze Joint Venture, a consortium of five Canadian engineering firms. According to Lieberthal and Oksenberg, leaders from Chongqing also demanded suddenly that the dam height be raised so substantially that it would cripple the project and free them from bearing the brunt of the costs. The new height and the demand for a more reliable study with the use of international standards resulted in a new feasibility study in 1986. In the face of much domestic and international pressure, the State Council agreed in March 1989 to suspend the construction plans for five years. After the Tiananmen Square protests of 1989, however, the government forbade public debate of the dam, accused foreign critics of ignorance or intent to undermine the regime, and imprisoned Dai Qing and other famous critics. Premier Li Peng crusaded for the dam and pushed it through the National People's Congress in April 1992 despite the opposition or abstention from one-third of the delegates. Such actions were unprecedented from a body that usually rubberstamped all government proposals. Resettlement soon began, and physical preparations started in 1994. While the government solicited technology, services, hardware and financing from abroad, leaders reserved the engineering and construction contracts for Chinese firms. Corruption scandals have plagued the project. It was believed that contractors had won bids through bribery and then skimped on equipment and materials to siphon off construction funds. The head of the Three Gorges Economic Development Corp. allegedly sold jobs in his company, took out project-related loans and disappeared with the money in May 2000. Officials from the Three Gorges Resettlement Bureau were caught embezzling funds from resettlement programs in January 2000. Much of the project's infrastructure was so shoddy that Premier Zhu Rongji ordered it ripped out in 1999 after a number of high-profile accidents including the collapse of a bridge. Zhu Rongji, who had been a harsh critic of the project, announced that the officials had a "mountain of responsibility on their heads". Around this time, a significant crack had also developed in the dam. To offset construction costs, project officials had quietly changed the operating plan approved by the NPC to fill the reservoir after six years rather than 10. In response, 53 engineers and academics petitioned President Jiang Zemin twice in the first half of 2000 to delay full filling of the reservoir and relocating the local population until scientists could determine whether a higher reservoir was viable given the sedimentation problems. Construction continued regardless. 1998-2003: The first group of generators began to generate power in 2003, and a permanent ship lock opened for navigation the same year. 2004-2009: The entire project is to be completed by 2009, when all 26 generators (with a combined generating capacity of 18.2 GW) will be able to generate 84.7 TWh of electricity annually, about one-thirtieth of the nation's electricity consumption. Phase 1 began in 1994 and ended in 1997 with the initial diversion of the Yangtze River. Phase 2 began in 1998 and is due to end in 2003 when the water level rises to 156 meters (511 feet) and the dam starts generating electricity. Phase 3 should end in 2009 when the water level reaches 175 meters (574 feet) and full power generation begins. As with many dams, there is controversy over the costs and benefits of this project. Proponents point to the economic benefits from flood control and hydroelectric power. Opposition is mainly due to concerns about the future of over a million people who will be displaced by the rising waters, the loss of many valuable archaeological and cultural sites, as well as the effects on the environment. Environmentalists internationally began to protest more vociferously. Human rights advocates have criticized the resettlement plan. Archeologists balked at the submergence of a huge number of historical sites. Many mourned the loss of some of the world's finest scenery. Critics see the dam as primarily serving the interests of east coast industrialists since they have the most need for the hydro-electric power. Unfortunately, this is at the expense of millions of people displaced from prime arable land. Making matters worse, relocation compensation has been inadequate (with corrupt officials stealing from the fund), the number of people displaced has been grossly underestimated, and their new land is of poor quality. 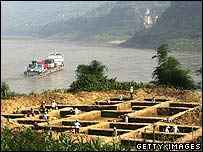 One of the Archaeological sites along the Yangtze to be submerged. The 600 km (370 mile) long reservoir will inundate some 1,300 archeological sites, and alter the legendary beauty of the Three Gorges. Cultural and historical relics are being moved to higher ground as they are discovered but the flooding of the Gorge will undoubtedly cover some undiscovered relics. Also many larger sites cannot be moved because of their size or design. These historical sites contain remnants of the homeland of the Ba, an ancient people who settled in the region more than 4,000 years ago. One of the traditions of the Ba was to bury the dead in coffins in caves high on the cliff. Concerns exist about the quality of construction materials used, highlighted by a major crack appearing in the dam in 2000, and have led some critics to fear a potential catastrophe similar to the Banqiao Dam failure in 1975. In an annual report to the United States Congress, the Department of Defense cited that ROC "proponents of strikes against the mainland apparently hope that merely presenting credible threats to China's urban population or high-value targets, such as the Three Gorges Dam, will deter Chinese military coercion." The notion that the ROC military would seek to destroy the Dam provoked an angry response from the mainland state media. PLA General Liu Yuan was quoted in the China Youth Daily saying that the PRC would be "seriously on guard against threats from Taiwanese independence terrorists". Despite a claim by ROC Deputy Defence Minister Tsai Ming Hsian on the contrary, most analysts believe the Republic of China neither has the ability nor will seek such technology to bomb the Three Gorges Dam due to the threat by Beijing to respond with overwhelming force. A group of 53 Chinese engineers campaigned for the government to rethink plans for the dam. If the reservoir level is filled to 156 m instead, 520,000 less people will have to be displaced, causing the government less hassle. The original plan for the Three Gorges Dam, approved by the National People's Congress in 1992, aimed to keep water levels behind the Three Gorges dam at 156 m for the first ten years. In 1997, dam officials changed the plans to maximize the dam's power output. In September 2004 the China Times reported that heavily armed guards had been deployed to the area to fend off a possible terrorist attack, but made no mention of who might want to target the dam. There are two hazards uniquely identified with the dam; sedimentation modeling is unverified, and the dam sits on a seismic fault. Excessive sedimentation can block the sluice gates, which can cause dam failure under some conditions. This was a contributing cause of the Banqiao Dam failure in 1975 that precipitated the failure of 61 other dams and resulted in over 200,000 deaths. Also, the weight of the dam and reservoir can theoretically cause induced seismicity, as happened with the Katse Dam in Lesotho. The installation of ship locks is intended to increase river shipping from 10 million to 50 million tones annually, with transportation costs cut by 30 to 37 percent. Shipping will become safer, since the gorges are notoriously dangerous to navigate. Each ship lock is made up of 5 stages taking around 4 hours in total to complete. Critics argue, however, that heavy siltation will clog ports such as Chongqing within a few years based on the evidence from other dam projects. The canal locks are designed to be 280 m (918 ft) long, 35 m (114 ft) wide, and 5 m (16.4 ft) deep. That is 30 m longer than those on the St Lawrence Seaway, but half as deep. The canal locks are designed to handle 10,000 ton barges. The project also includes a ship lift, a kind of elevator, which will be capable of lifting ships of up to 3,000 tons. In the original plan the ship lift would carry 10,000 ton vessels. Increasing numbers of engineers doubted whether the dam would actually achieve its stated purposes. Chinese journalist/engineer Dai Qing published a book relentlessly criticizing the project by the Chinese scientists, yet many foreign construction companies continued to press their governments to financially support the construction in hopes of winning contracts. Chinanews, May 19 – The underground power station of the Three Gorges, regarded as one of the two objects along with the ship elevating machine, is gradually taking shape after a year’s construction. The underground power plant is located inside the mountains at the right bank and is 1.5 times as large as the Gezhouba hydroelectric station. The power plant looks like a large underground maze intersected with numerous holes, with the small ones measuring only a few dozens of meters and the large ones extending to hundreds of meters in length. A construction worker told this reporter that the power plant now consisted of six holes for water to come in, three sub-holes for construction purpose, one sub-hole for transportation purpose and several holes for air ventilation purpose. Without their guide, one will easily get lost inside. Walking hundreds of meters along the zigzagging construction holes, and taking turns at some places, one suddenly sees a big arch-shaped room in front. Illuminated by large lights, the underground room is as bright as day, where six 700,000-kilowatt hydrogenerators will be installed. Manager of the Three Gorges Hydropower Plant Ma Zhenbo said by 2009 when the Three Gorges project was completed, the underground power plant would start to generate power by using the waste water from the dam at flood period, which would generate as much as 3.7 billion kilowatts power and put as much as 90% of the water in the Three Gorges Dam to use. The underground power plant consists of a water diverting system, hydropower generating system, and tail water controlling system. It aims to adjust power at peak period. Also, when machines in the power plants at the left and right banks need overhaul, the underground power plant will help generate power. Chinanews, March. 31 – After a long siren, a huge blast occurred near the Three Gorges dam. 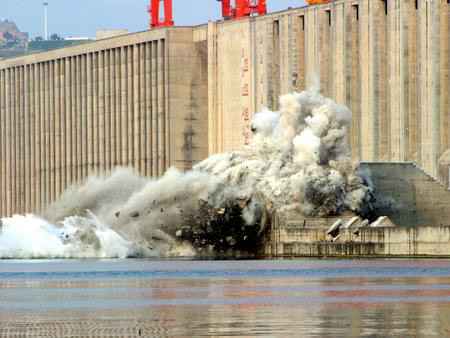 The RCC third phase cofferdam, built with 980 cubic meters of concrete, was destroyed by explosives within seconds. The Three Gorges dam survived in one of the biggest explosions implemented on Thursday. The sensors installed in 15 sites at various parts of the dam showed that the Three Gorges dam remained intact after the explosion. General engineer for the Yangtze River Committee Zheng Shouren introduced that the RCC third phase cofferdam measured 500 meters long, 8 meters wide, and 31.5 meters tall. The explosion implemented on Thursday was one of the biggest in world, with 200,000 cubic meters of concrete being destroyed in an explosion that was done 35 meters beneath the water. This is the first explosion for the RCC third phase cofferdam and another two explosions will be carried later. The largest explosion will be done in June. To carry this explosion, constructors used some 225 highly accurate detonators. The fuse was measured some 70 meters long, and 312 kilograms of explosives were consumed. The explosion site was only 60 meters away from the well-known Three Gorges dam. In order to guarantee the safety of the dam, constructors carried the explosion in separate times and the timing was pinpointed to millisecond. The whole explosion process was finished within one second and the largest explosives used at one time weighed about 11 kilometers. All these were to make sure that the possible effect to the dam would be reduced to zero. Academician Zheng Shouren said the RCC third phase cofferdam was completed in 2003. The 140-meter high cofferdam was an impediment to the 110-meter electricity power plant at the right side of the bank, blocking water from coming in. Therefore they decided to destroy it. Click the pictures at left for a larger view. They will appear in the space below. Construction workers are making holes to store explosives on March 30, 2006. About 140 holes are made for the blast. The last glimpse of the cofferdam before it is destroyed, on March 30, 2006. The RCC third phase cofferdam built with 980 cubic meters of concrete turned into debris in a blast that contains 312 kilograms of explosives at 17:25, March 30. 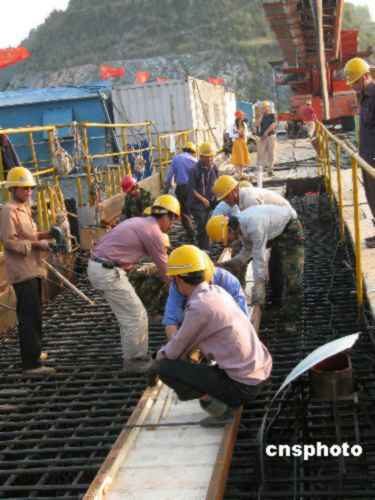 Reinforced steel bars are seen before concrete is poured on the giant dam of the Three Gorges Project on the Yangtze River May 17, 2006. 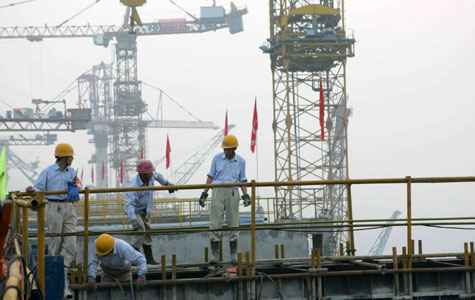 Photo taken on May 17, 2006 shows the construction site of the Three Gorges Project on the Yangtze River. China's Three Gorges project has officially begun storing water in its huge reservoir, amid ongoing concerns over cracks in the controversial $US25 billion ($38.4 billion) dam. Nineteen of the dam's 22 sluice gates were shut, beginning at midnight on Saturday (2am AEST on Sunday) as water levels rose to 106 metres before noon on Sunday. State television broadcast live the closing of the gates. The water level behind the controversial dam in central Hubei province will rise by four to five metres daily and is expected to reach 135 metres by June 15. Navigation on the Yangtze River near Yichang, where the dam is located, has been stopped while the water rises and is scheduled to resume on June 16. After two weeks, the reservoir should be 436 square kilometres. Construction of the Three Gorges project is expected to be completed in 2009, with the dam's third construction phase, which includes the installation of another set of generators, about to begin. 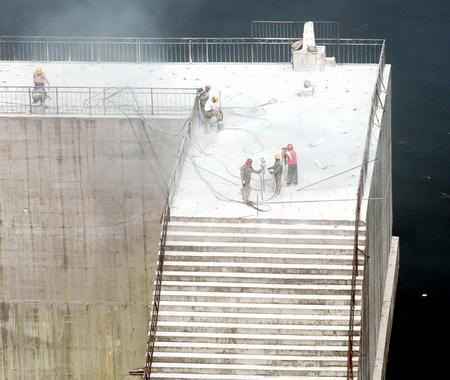 The closing of the sluice gates comes after a general inspection of the dam in mid-May revealed that repair work to fix large cracks on its 185 metre-high concrete face had not been completely successful. "We found that some of the vertical cracks on the dam that were repaired have reopened, even though we put a great deal of money and effort into the repair work," Pan Jiazheng, an engineer, said in a speech following the end of the inspection. "We have a long way to go, as we enter the third phase of the dam construction. I hope we will do our best to build a first-class project rather than a dam with 10-metre-long cracks," he said in the speech published by the Changjiang Water Resources Commission. Mr Pan, 75, a member of the Academy of Sciences of China and the former deputy director of the Engineering Academy, added, "We should absolutely not be proud of ourselves." The highly controversial project has been criticised as an environmental disaster and the destroyer of a cultural and historic tradition in the scenic gorges that have been the centre of life on the Yangtze river for millennia. Naysayers have questioned whether the vast amount of energy generated by the dam, about 84.7 billion kilowatts a year, can be sold, while doubting the huge project's ability to control floods on the river's traditional flood plains hundreds of kilometres downstream. Officials report that the plan is within its US$25 billion budget and insisted early on that the project would pay for itself through electricity generation. However, the project is thought to have cost more than any other single construction project in history, with unofficial estimates of US$100 billion or more. Chinanews, May 19 - The Chinese government promised recently that it would offer financial supports to emigrants from the Three Gorges Dam area for 20 years, and the supporting funds will be withdrawn from the yearly profits of the Three Gorges Power Plant. China Three Gorges Project Corporation manager Li Yong'an said that the Chinese government would release a new policy to offer more supports to those emigrants. The initial plan is to proceed with financial supports for 2 decades. According to Li, by the end of this March 1.1278 million emigrants from the Three Gorges region have settled down, with 42.45 million square meters of various houses built for them and compensation funds hitting 44.9 billion yuan (US$5.61 billion). It is learnt that the supporting funds will be withdrawn from the yearly profits of the Three Gorges Power Plant. The funds will be mostly used to subsidize those emigrants' life, in order to enable the emigrants that have moved for the power station's construction to share the benefits from the project, said Li. Chinanews, May 18 - China Three Gorges Project Corporation (CTGPC) chief accountant Yang Ya suggested on the 16th that based on the current price of electricity, the Three Gorges Project (TGP) will basically recover its investment when the power it generates accumulates to 1 trillion kilowatt-hours. This goal is expected to be fulfilled between 2015 and 2017. Yang indicated that TGP serves as a pivotal water conservancy project that can be used for flood prevention, power generation and navigation, while its profitability is highlighted by the value of electric power assets. The Three Gorges Power Plant records 18.2 million kilowatts of installed capacity, with the designed average annual power generation reaching 84.7 billion kwh. Its strong and clean renewable power will be transmitted to power grids in east and central China and Guangdong Province as well at a competitive price, which will brings about steady and reliable capital support. Up through this April, its cumulative power generation had surpassed 100 billion kwh. Calculated at 0.25 yuan (US$0.03125) per kwh, the on-grid power price approved by the State Council, hydropower generation alone will bring 25 billion yuan of annual revenue. A report of CTGPC shows that by 2026, its installed hydropower generation capacity will surpass 63.6 million kw, with yearly power generation exceeding 300 billion kwh and the annual revenue of hydropower business topping 60 billion yuan. CTGPC sees a quite healthy financial status. Besides the ability to make profit, it has established a sustainable financing mechanism as well, which enables it to provide powerful capital guarantee for the nonstop hydropower development in the upper Changjiang River. "The assets-liability ratio of global power enterprises is usually controlled within 60%, while ours is around 40%. Therefore our capital structure is preferable among hydropower corporations worldwide," said Yang. Although hydro-electric power is a renewable energy, the creation of large reservoirs can generate considerable quantities of greenhouse gases, including substantial amounts of methane, due to micro-biotic activity. Compared to the greenhouse gas emissions of conventional natural gas power plants, emissions from northern reservoirs are typically about 5% of conventional power plants, while emissions from tropical reservoirs are typically 25%. The amount of power generated by the dam in 2009 was originally anticipated to supply about 10% of China's electricity needs, but with China's rapidly growing economy it is only projected to produce approximately 3% at the end of 2006. Over 80% of the country's power is currently produced by coal. Huge reservoirs by their nature alter the ecosystem and threaten some habitats while helping other habitats. The Chinese River Dolphin and the Chinese Paddlefish, for example, are on the edge of extinction and will lose habitat and suffer divided populations due to the dam. Of the 3,000 to 4,000 remaining critically endangered Siberian Crane, approximately 95% currently winter in wetlands that will be destroyed by the Three Gorges Dam. While logging in the area was required for construction which adds to erosion, stopping the periodic uncontrolled river flooding will lessen erosion in the long run. The build up of silt in the reservoir will, however, reduce the amount of silt transported by the Yangtze River to the Yangtze Delta and could reduce the effectiveness of the dam for electricity generation, and perhaps more importantly, the lack of silt deposited in the river delta could result in erosion and sinking of coastal areas. Cities such as Shanghai need ever increasing electricity to power its new modern skyline. With 26 HEP Turbines generating up to 18 gigawatts of electricity, the equivalent of roughly eighteen coal power stations or 11,000 barrels of oil per hour, the Dam will be a huge benefit to this power shortage. Filling this demand for energy with hydroelectric power will also be welcomed by environmentalists as China has been criticised for relying too heavily on fossil fuel in recent decades. While in the short term the dam will cause extra pollution, the dam could potentially reduce China's annual coal consumption by 40 to 50 million tons, thus reducing the discharge of two million tons of sulfur dioxide and 10,000 tons of carbon monoxide a year. Ecologist Hou Xueyu was among the few who refused to sign the environmental report, claiming that it falsely overstated the environmental benefits provided by the dam, failed to convey the real extent of environmental impact, and lacked adequate solutions to environmental concerns. Chinanews, May 15 - In a recent interview with Xinhua News Agency, Xie Xiufa, senior engineer of the Three Gorges Bureau under the Yangtze River Water Resources Committee, stated that the Three Gorges Project (TGP) itself is a project featuring environmental protection from the ecological angle. As a clean energy, it saves is 50 million tons of coal equivalent for China every year. Xie indicated that hydropower is the cleanest energy. Compared to coal-fired power plants, the Three Gorges hydropower station equals seven thermal power stations, each of which has an installed capacity of 2.6 million kilowatts. Every year, it can reduce 50 million tons of coal consumption, approximately 100 million tons of carbon dioxide, 2 million tons of sulfur dioxide and around 10,000 tons of carbonic oxide, about 370,000 tons of nitrogen oxide as well as a large quantity of industrial waste discharges, which will greatly alleviate environment pollution and acid rain in China, its neighboring countries and regions. The function of environmental protection of TGP is also reflected in its flood-control effectiveness. The frequent floods in the upper and lower reaches of the Yangtze River destroy ecology as well. After completion, TGP will highly raise the flood-control standard in this area, safeguard millions of people and their belongings, insure their living space and displays a gigantic environmental effect. Xie said that any large project would have impact on the surrounding environment as well as society, the economy and environment in relevant regions. However, the adverse effect can be minimized by taking effective measures during the construction. According to the current monitoring condition, TGP has posed no serious impact on water quality, geological conditions and the climate. On the whole, the project has rendered more benefits than harms to the environment. May 14 - Water quality at the upper reaches of the Yangtze River, China's longest waterway, has remained unchanged after the Three Gorges Dam began storing water in 2003, says a chief builder of the project. "The dam area has maintained a sound ecological environment and water in the Yangtze's upper reaches is still up to drinking standards," said Xie Xiufa, a water conservancy specialist and senior engineer with the Yangtze River Water Resources Committee, in an exclusive interview with Xinhua on Sunday. The natural water flow in Yangtze's Three Gorges was stopped on June 10, 2003 to make way for further construction of the Three Gorges Dam, which is believed the largest water control project in the world. Thanks to China's efforts to curb water pollution, soil erosion and geological disasters, the water control project has not posed a threat to local environment, said Xie, adding, "Water quality in the Three Gorges reservoir has met the country's surface water standards and remained more or less the same as before the Yangtze was dammed." The Chinese government plans to spend nearly 40 billion yuan (US$5 billion) between 2001 and 2010 on at least 150 sewage treatment plants and 170 urban garbage disposal centers to prevent water pollution in the Three Gorges Dam and the upper reaches of the Yangtze River. Xie said the Three Gorges water control project has "fine-tuned" the local climate. "We've observed an average temperature rise by 0.2 degree Celsius -- a rise between 0.3 to 1 degree Celsius in winter, but a fall between 0.9 and 1.2 degrees Celsius in summer. So we're having warmer winters and cooler summers in the dam area." The expert also ruled out possibility of major earthquakes in the Three Gorges Dam area, which is far from quake-prone regions. The maximum tremor ever detected there measured 2.5 on the Richter scale. China has built a joint surveillance network to monitor the water quality, tremors and climate changes in the Three Gorges Dam. Meanwhile, botanists have been working to preserve biodiversity in the dam area to improve its ecological environment, he said. Launched in 1993, the Three Gorges Project, including a 185-meter-high dam and 26 generators on both banks of the Yangtze River, is being built in three phases on the middle reaches of the Yangtze. The mammoth dam of the Three Gorges Project is expected to be completed next Saturday. In accordance with the construction schedule, the entire Three Gorges Project will be completed in 2009 and by then, it will be able to generate 84.7 billion kwh of electricity annually. Chinanews, Three Gorges, May. 18 - Since June, 2003 when the Three Gorges Dam reservoir was filled with water to its full capacity of 135 meters, more than 1,000 big earthquakes of different magnitudes have been detected in the Three Gorges Dam area with the biggest one being magnitude three on the Richter scale, said Cao Guangjing, vice general manager of the China Three Gorges Project Corporation when he met with foreign press yesterday, adding that as time went by, earthquakes in the dam area would diminish and disappear in the end. Cao said that before the Three Gorges Dam project was started, experts had fully considered the earthquake issue and held in depth discussions about such issue. The digital monitor system installed near the Three Gorges Dam showed that the dam had been able to withstand all those earthquakes. Those earthquakes had not caused any casualties or injuries to people, or damages to houses, least to say any damage to the dam itself. It is normal that dam construction would cause earthquakes, but judging from the past experiences, Cao said, normally the magnitude of such earthquakes would not exceed the magnitude of earthquakes that generally occur in dam areas. From the long-term geological research done in the Three Gorges Dam area and research on earthquakes resulting from dam construction, scientists found that the earth crust movement in and near the dam area was stable. The material used for building the banks consists mainly of hard or semi-hard rocks. There is no big fault near the dam, no neotectonic movements or earthquake movements taking place in the area, which is to say that it is unlikely for any serious earthquakes to occur in the dam area. Even after water is filled into the dam and the reservoir might cause some earthquakes, the maximum magnitude of such earthquakes would be less than six on the Richter scale, which would be the highest-magnitude earthquake in the area, and the Three Gorges Dam has been so built that can sustain earthquake of magnitude seven on the Richter scale. 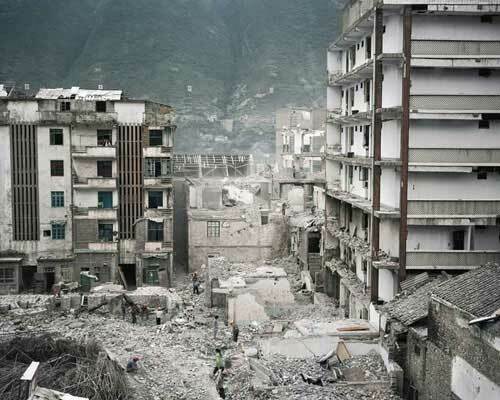 Therefore such earthquakes cannot damage the main buildings in the Three Gorges Dam. Everything about the Three Gorges dam is huge, including the number of people it has affected. The reservoir created by the dam has already displaced more than a million people. Another 80,000 are still to be moved as it reaches its final stages. Some estimates say at least 1,200 villages and two major towns have had to be abandoned and rebuilt. From the start, the central government promised cash compensation for all those forced to move. It also promised them new homes and new livelihoods. But that process has been highly controversial. Many families complained that much, in some cases most, of the compensation due to them was siphoned off by corrupt local bureaucrats. Official accounts seem to support their complaints that millions of dollars have been embezzled. The Chinese media has reported that some officials have been investigated for corruption - but the complaints continue. To some, the dam illustrates the ability of the Chinese government to forge ahead with audacious multibillion dollar projects, heralded as in the long-term good of the nation, but with devastating consequences for local communities who remain largely voiceless. Those trying to highlight concerns about the social impact of the Three Gorges dam are also worried about the precedent it sets. The Chinese government sees it as a focus for national pride. It may also prove a model for further big dam projects, part of the country's struggle to meet its growing energy needs. If the rights of these villagers are not respected, say activists, there is no reason to expect the rights of other displaced communities in the future to be any better safeguarded. The debris in these pictures are the result of an order issued by the Planning Commission for Relocation. When a building had been evacuated, it was then demolished so that passing ships would not snag their bottoms on taller buildings, but the orders extended even to houses. The reservoir's 22,202,673,076 m³ (18 million acre-foot) (24,452,283 U.S. Tons of Flood water) (equivalent to a cube 2.8 km on each side) flood storage capacity will lessen the frequency of big downstream floods from once every 10 years to once every 100 years. But critics believe that the Yangtze will add 530 million tones of silt into the reservoir on average per year and it will soon be useless in preventing floods, the system designed to flush out the silt relies on an unproven sequence of sluice gates. Increased sedimentation resulting from the dam could increase the already high flood level at Chongqing. There is also a contradiction between the roles of the dam as flood control and hydroelectricity production. Flood control requires dam levels to be kept low, allowing for increased flow throughout flood times, whereas hydroelectricity requires higher levels to allow for continual escape of water to produce the electricity. Probe International asserts that the dam does not address the real source of flooding, which is the loss of forest cover in the Yangtze watershed and the loss of 13,000 km² of lakes (which had greatly helped to alleviate floods) due to siltation, reclamation and uncontrolled development. Chinanews, May 17 – Vice General Manager of the China Three Gorges Project Corporation Cao Guangjing said that the Three Gorges Dam was invulnerable to attacks by conventional weapons and was ready to stand the test of nuclear war. Cao made the remarks in response to warnings made by some Chinese military analysts. In their warnings, these analysts said that the Three Gorges Dam might become a target of attack by terrorists, who might threaten to destroy the dam with nuclear weapons, cruise missiles, long-range bombers, or bomb attacks by special troops. Cao said the Three Gorges Dam was a concrete gravity dam with considerable high safety quality. The dam itself is sturdy due to its heavy weight. Before construction was started, designers of the dam had already taken disastrous factors, such as earthquake, into consideration, so it is almost impossible to destroy the dam with conventional weapons. Measures have also been adopted to guard the Three Gorges Dam against any nuclear attacks. “At present, the dam can discharge water at 110,000 cubic meters per second. Usually, all water stored in the dam can be released within four or five days. If we increase the discharge volume, the process can take even less time. So, even if the dam can be destroyed all of a sudden, it won’t cause much disaster,” said Cao. He also revealed that during the dam designing process, experts had discussed about and carried out some experiments on the possible impact that the dam could bring once it was destroyed. The experiments showed that once the dam was damaged, it could only affect some areas in the lower part of the dam, not the whole plain area in the lower Reaches of the Yangtze River as some people would have us believe. THREE GORGES DAM SITE, Hubei Province, May 21 - The major structure of the gigantic Three Gorges Dam on the Yangtze River, China's longest, was completed Saturday. The project, often compared to the Great Wall in its scale, absorbed and benefited from a great amount of opinions from opponents, which enabled its schemes to improve continuously. "Naysayers contributed significantly to the Three Gorges Project, "said Pan Jiazheng, head of the experts panel for the project and academician of the Chinese Academy of Sciences and the Chinese Academy of Engineering. Pan, together with another 50 or so members from the panel, witnessed the completion of concrete placement for the Three Gorges Dam's main wall Saturday. "As for a project, it is not necessarily favorable if there is no opposing opinions. The more naysayers, the more thorough and detailed related researches and proofs may go," said Pan during an interview with Xinhua. Now in his 80s, Pan himself had been an opponent to the Three Gorges project before he became a chief tech advisor for the feasibility study on the project. According to Pan, in the 1950s, debates centered on China's financial and technological capabilities for the project. However, such concerns have webbed gradually since the late 1980s, along with China's endeavors to grow powerful economically and technologically. In 1986, the Ministry of Water Resources invited 412 experts to start the feasibility study for the Three Gorges project, and Pan was appointed the head of the group. The Three Gorges project was approved by the National People's Congress, China's top legislature, in April 1992, 38 years after related researches and proof officially began in 1954. Pan said, "Generations of scientists, both at home and from abroad, participated in the planning, designing and consulting of the project." "Opinions and proposals from those scientists, including naysayers, were solicited. Views from opponents helped improve the democratic and scientific decision for the project," Pan stressed. He said in the process of proof, some experts and scholars made researches on budgetary estimates for the project, future silting in the project's reservoir, possibility for geographic disasters, including earthquakes, the project may induce, cost of residents relocation and any effect the project may have on ecosystem and environment. They also studied engineering problems and technical means, advancing various proposals and opinions. Some used to worry that the project would become a siphon of funds. Actually, it has saved 20 billion yuan (US$2.5 billion) and managed to limit the total cost at approximately 180 billion yuan (US$22.5 billion). "Not all of its generators have begun operation, but the project has achieved an annual balance between expense and revenue," Pan said. He said from 2006, annual income by the 14 operational sets of generators of the project will cover the funds allocated the Central Government for the project in each of the coming years. "Nothing on earth embraces advantages only. It is imperative for us to maximize the advantages while minimize the disadvantages," Pan said. Navigation: Two-way lock system became operational in 2004. One-step ship elevator due to open in 2009. Excavation: 102.6 million cubic meters of earth and stone (134 million cubic yards). Concrete: 27.2 million cubic meters (35.5 million cubic yards). Steel reinforcing bars: 354,000 tons. Dam height: 185 meters (607 feet). Dam length: 2,309 meters (1.4 miles) divided into three parts. In the center will be a 484-meter spillway section with 23 bottom outlets and 22 sluice gates. On the left and right of the spillway will be two giant power stations. Average width: 1.1 kilometers (0.7 miles). Length: 600 kilometers (370 miles). Storage: 39.3 billion cubic meters of water (51.4 billion cubic yards). Water level: elevated 175 meters (574 feet) above Yangtze River surface. Runoff: 451 billion cubic meters (589 billion cubic yards) of Yangtze River water will flow into the reservoir annually. Silt: The muddy Yangtze will discharge 530 million tons of silt into the reservoir in a typical year. Machinery: The two power stations flanking the dam's central spillway will operate 26 of the world's largest turbine generators, 700 megawatts each. Capacity: Total generating capacity will be 18,200 megawatts, or as much as big 18 nuclear power stations. Transmission: Fifteen 500,000-volt transmission lines will send electricity to Shanghai and elsewhere throughout East China , Central China and eastern Sichuan Province . Output: 84.7 billion kilowatt hours of electricity annually, equivalent to burning 40 million tons of coal. Ship lock will consist of five locks, each 280 meters (918 feet) long and 35 meters (114 feet) wide, with a water depth of 5 meters (16.4 feet). Supposed to handle 10,000 ton barges. Ship lift will be a one-stage vertical lift capable of carrying a 3,000-ton passenger or cargo vessel. River shipping through central Yangtze estimated to increase from 10 million to 50 million tons annually, with transportation costs cut by 30-37 percent. Dam sponsors say the reservoir's 22.1 billion cubic meter (28.9 billion cubic yards) flood control storage capacity should lessen the frequency of big downstream floods from once every 10 years to once every 100 years. Life in Chongqing has been badly disrupted. China's enormous Three Gorges dam remains on high alert as waters from the flooded Yangtze river continue to pour into the reservoir behind it. Water levels were expected to peak on Wednesday, but officials insist the massive dam is able to cope. Floods and landslides caused by heavy rains upstream from the Three Gorges have already killed 160 people. Navigation through the dam's locks has been suspended for the first time since operations began earlier this year. The Chinese authorities are reinforcing the structure's outlying bulwarks to deal with the fast-rising waters. The massive dam project, built at a cost of $25bn, is supposed to help control China's annual flooding. But it continues to be highly controversial, even though China desperately needs the power it is designed to generate, says the BBC's Francis Markus in Shanghai. According to Ute Collier, the dams initiative leader for the World Wildlife Fund, the main danger concerns people living below the dam. As water fills the reservoir from the swollen rivers above, the level has to be reduced by releasing extra water downstream to alleviate pressure on the walls of the dam. "This could become a serious problem if the rains continue," Ms Collier told BBC News Online. Villages in Hubei province, downstream on the Yangtze River, are said to be braced for a possible surge in water levels. Ms Collier says part of the reason China suffers such acute flooding on the Yangtze is because huge areas of land have been deforested, leading to run-off water filling the rivers, which are then unable to cope when there is heavy rainfall. "There needs to be an effort to allow natural flood plains to do their work," she said. "Artificial dams have trouble dealing with extreme events like this." Upstream from the Three Gorges, floods and landslides unleashed by torrential rain have already left 160 people dead. Many others are missing and thousands are reported to be injured or sick, following five days of incessant rain that has swamped rivers in a wide area of south-west China. In some areas of Sichuan province and Chongqing municipality, the flood waters have been so deep that they have submerged four-storey buildings. Entire communities have been marooned. More than 450,000 people have been evacuated and 127,000 homes destroyed or damaged, the China Daily newspaper reported. 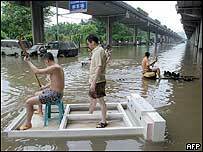 The worst-affected area is said to be the city of Dazhou, which was hit with 360mm (14.4 inches) of rain. Thousands of military personnel, police and other rescue workers are helping to distribute food and medicine in the area. The official Xinhua news agency described the situation as a "catastrophe which is not likely to happen in a century". Meteorologists warn that at more major storms will strike the region in the coming weeks. Builders marked the occasion with a colourful celebration ceremony. China has completed construction of the main wall of the Three Gorges Dam - the world's largest hydro-electric project. 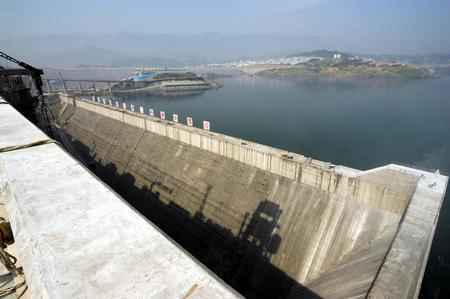 The controversial dam in central Hubei province will not be fully operational until 2009, once all its generators are installed. China says it will provide electricity for its booming economy and help control flooding on the Yangtze River. Critics say over a million people were moved from the area, and the reservoir behind the dam is already polluted. On Saturday, builders poured the last amount of concrete to complete the construction of the 185m (607ft) high, 2,309m (1.4 mile) long wall. A senior Chinese official said the event marked a "landmark progress" in the dam's construction, the state-run Xinhua news agency reported. 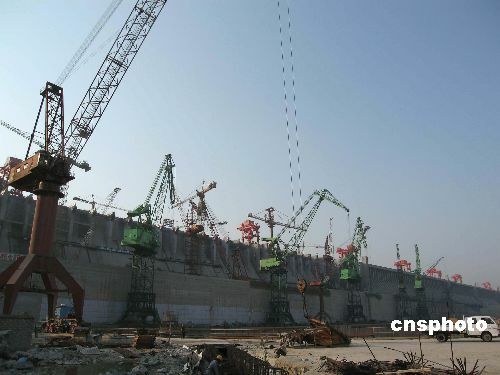 "However, tasks such as building of power houses of the dam, the ship lock and shiplift are still formidable," said Pu Haiqing, deputy director of the dam's construction committee. When its 26 turbines become operational in 2009, the dam will have a capacity of more than 18,000 megawatts. Already the world's second-largest consumer of oil, China says it needs alternative energy sources to combat widespread power shortages and keep its booming economy powering along. The authorities also hope the dam will help control flooding on the Yangtze River, which in the past has claimed hundreds of thousands of lives, the BBC's Quentin Somerville in Shanghai reports. But campaigners say the dam comes at too high a cost. Over a million people have been moved from their homes to make way for the project and more than 1,200 towns and villages will disappear under its rising waters. Environmentalists say the water behind the dam is already heavily polluted. China says the whole project will cost about US$25 billion Yuan (£13bn), but environmentalists estimate it to be several times higher. Workers pour cement at the top of the Three Gorges Dam yesterday. The world's largest dam is scheduled to complete construction on its main wall this afternoon. ADVERSE environmental effects from the construction of the Three Gorges hydroelectric project are under control, a top official said yesterday, a day before workers were scheduled to top off the massive dam in central China. Cao Guangjing, deputy general manager of the China Yangtze River Three Gorges Project Development Corp, said the builder has taken comprehensive measures to deal with the project's environmental impact. "The negative effects of industrial sewage and dust produced in the project's construction process are under control," Cao said. Minimizing the effects of the building effort on the surroundings ecology has been a key concern since ground was broken in 1994, said Sun Zhiyu, head of the developer's environmental protection section. He said a large quantity of sewage was produced during the concrete manufacturing process and had to be decontaminated before it could be discharged. Sewage treatment and garbage disposal plants are being built at a combined cost of 40 billion yuan (US$5 billion), to protect the ecosystem and water quality in the dam area. The project development corporation also has spent 10 million yuan annually over three years to skim floating garbage from upstream of the dam. The latest evaluation by the Three Gorges Water Environmental Monitoring Center found that the reservoir behind the dam met state drinking-water criteria. Authorities also worked over the past 10 years to reduce river silt by protecting forests and planting trees around the dam and in the upper reaches of the Yangtze River. The effort has resulted in the reduction of 100 million tons of silt a year, authorities said. The 180-billion-yuan hydro project will feature a 185-meter-high dam and 26 generators on both banks in the middle reaches of the Yangtze. It will be capable of generating 84.7 billion kilowatt-hours of electricity a year. The dam is scheduled to be finished today, and the entire project is to be completed in 2009. The Three Gorges - Qutang, Wuxia and Xiling gorges - extend for about 200 kilometers on the upper and middle reaches of the Yangtze. They are a world-class tourist destination noted for beautiful natural landscapes and a great number of historical and cultural relics. An ancient legend claims the Three Gorges were cut by Dayu, a flood control hero, when he was combating the rising waters. In addition to generating electricity, the project is also designed to harness flooding and benefit shipping. Cao said the dam is not only designed to withstand a once-in-a-1,000-year flood, it is also solid enough to survive other major natural disasters and terrorist attacks. He said China has instituted emergency plans to guard the hydropower project against terrorist attacks by conventional and nuclear weapons. YICHANG, China (Reuters) - China's Three Gorges dam draws a step nearer to completion with the pouring of the last concrete on Saturday, but debate rages over the environmental and social consequences of the world's largest hydropower project. The dam, where workers are still toiling on the 2,309-meter (7,400-ft) long expanse of concrete spanning the Yangtze River, will generate 18 gigawatts of hydropower when it is complete and, it is hoped, tame floods on the notorious waterway. But the $25 billion project is as much a symbol of China's own power as anything else. The broad streets and new towers of Yichang, the city of 4 million that is the gateway to the project, attest to the investment poured in since the dam was approved. But some residents are also eyeing critics' warnings of environmental damage they say in the long run will outweigh the benefits. "We hear there could be problems related to geology and ecology, but it won't really be clear until the future what those problems are," said a resident surnamed Xie, holding his baby son as he headed out to buy steamed buns for breakfast. Environmentalists say the water quality in the river has already deteriorated, fish species are declining and silt trapped behind the dam is causing erosion -- even as far away as the estuary in coastal Shanghai. They warn the dam's reservoir, which will reach a depth of 156 meters (515 feet) by October, will turn into a cesspool of raw sewage and industrial chemicals backing onto Chongqing, the metropolis of 30 million upstream from Yichang. For the more than 1 million residents already flooded out of their homes, the dam's consequences are all too real. "Resettlement will determine whether the Three Gorges project is a successful one or not," Li Yongan, president of the Three Gorges Project Development Corporation, told reporters. "If they are dissatisfied, people can report to the local government." But petitioners say it is the local governments that are the problem, pocketing some of the 25 billion yuan ($3.1 billion) Li says has been spent on resettlement. The government said this week it will provide funds to support resettled migrants for the next 20 years, but critics say no amount of money can replace the whole cities and archaeological treasures submerged by the waters. "They had their communities, their relatives, their ways of life and their skills," Dai Qing, an activist who has lobbied against the project, told Reuters. "A lot of migrants still haven't adapted to their new lives." Another 300,000, about 80,000 of them this year, are still to be moved before the reservoir rises to its full level by 2009. The effects of the sheer weight of the 600 km (375 mile) lake are also not understood, with some geologists saying it could make the area more prone to landslides and earthquakes. The list of concerns about the project have led critics such as Dai to argue that it is political folly, pushed forward to prove a point about China's prowess despite the human and environmental costs. "They had to realize this project to say 'this is something you foreigners couldn't do, but us Chinese could do it, our socialist system could do it'," she said. Cao Guangjing, vice-president of the Three Gorges building company, said he had complete confidence in the dam. "The Three Gorges proves China can build anything well," he told reporters. "I personally have never had any doubts. I believe in it 100 percent." China's leaders have long dreamed of taming the mighty Yangtze River. The founder of the Chinese Republic, Sun Yatsen, first proposed the idea as a response to the flooding which has blighted the lives of those living along the river for thousands of years. Chairman Mao wrote a poem in which he described a "great wall of stone" that would mean "a smooth lake rises in the narrow gorges". But work on a dam did not actually begin until 1993 under then President Jiang Zemin. And with the main wall of the Three Gorges Dam now finished, the dream is getting closer all the time. The wall stretches for more than 2km across the Yangtze and is the largest part of this multi-billion dollar scheme. It is not the end of the project - there are still turbines and other equipment to be installed - but it is a major milestone on the way to finishing the dam. When it is finished it will be the largest hydro-electric power project in the world, its 26 generators pumping out 85bn kW-hours of electricity a year. Construction may be drawing to a close after 13 years but that is unlikely to stop the controversy about building the Three Gorges Dam in the first place. Critics say the human cost has been far too high. More than a million people have been moved to make way for the dam. At least 1,200 towns and villages will be submerged under the rising waters of the dam's reservoir. The government says those who have been relocated will have new homes, jobs and compensation. But many locals say corrupt officials have taken their money and they cannot make a living. Although the authorities say they have investigated and prosecuted many officials, the problem still persists. Environmental campaigners say that an area of outstanding natural beauty will be lost to the world forever under the waters of the Three Gorges. And they warn that the reservoir behind the dam is already severely polluted and likely to get worse as much of the waste from big cities upstream like Chongqing flow into the Yangtze. Activist Dai Qing says the dam is causing more problems than solutions, insisting: "The electricity produced by the dam is much more expensive than that produced in other ways, because it costs tons of money to relocate local people and to offset the disasters it has caused to build the dam." The Chinese government says it is spending billions of dollars on sewage treatment facilities. And it is pressing ahead regardless of the critics. China desperately needs electricity for its booming economy. Power shortages are common now in many cities during the summer. That is when millions of Chinese across the country switch on their air conditioners to cool down during the baking heat. So the Three Gorges is part of China's energy strategy. The authorities also hope the dam will help control flooding on the Yangtze which in the past has claimed hundreds of thousands of lives and in recent years, caused millions of dollars worth of damage. And the government has plans to build more dams on the Yangtze and other rivers across China. These vast structures have become symbolic not only of China's engineering and construction capabilities but also of the Communist Party's desire for economic progress regardless of the human or environmental cost. The Three Gorges Project on the Yangtze River in China will be able to generate 47 billion kwh of electricity this year. An executive with China Yangtze River Three Gorges Project Development Corporation explained that the installed capacity of the project would increase to 9.8 million kw as the last three of the 14 planned generating units on the northern bank of the Yangtze River will begin power generation and be brought onto the grid later this year. Launched in 1993, the Three Gorges Project is being built in three stages on the middle reaches of the Yangtze River, China's longest. Preparations and construction of the first phase were carried out between 1993 and 1997. The Yangtze was dammed at the Three Gorges area for the first time on November 8, 1997. In accordance with an original plan, the Three Gorges Project, with an estimated cost of 180 billion yuan (approximately US$21.7 billion), will have 26 generators with a combined generating capacity of 18.2 million kW. The project will be able to generate 84.7 billion ks/hours of electric power annually when it is completed in 2009. But, a revision of the plan also calls for inclusion of a new underground power plant with six new 700,000-kW generators. The remaining 18 generating units of the Three Gorges Project, which is also one of the major water control works to harness the Yangtze, will all be installed on the southern bank of the river. Eleven generators had been put into service by July 10, 2003 when the first of the project's generators began working. The project produced 39.1 billion kwh of electricity last year, 5.72 billion kwh more than the state-set quota. Half of the power generated was sent to economically developed east China, 25 percent to central China and the remainder to south China's Guangdong Province, said Li Yong'an, general manager of China Yangtze River Three Gorges Project Development Corporation. Several ships sail in the diversion channel after passing the permanent ship lock of the Three Gorges Project on the Yangtze River in central China's Hubei Province, July 6, 2004. Official announcement said on Thursday that the permanent ship locks function well with a water level between 135 m and 139 m, thus the trial navigation will be turned into full functional navigation since July 8, 2004. The construction of the ship lock began in 1994. It started its trial navigation on June 16, 2003 and was open to public on June 18 the same year. The giant ship lock of the Three Gorges Water Control Project on the Yangtze River opened officially for navigation on Thursday following a one-year successful trial operation. The ship lock, which features a two-way lifting facility for the 113-meter drop between the upstream and downstream separated by the gigantic dam, went into trial operation after the Three Gorges reservoir began to store water in June 2003. The lock, which was built entirely by Chinese engineers after solving a number of unprecedented technical difficulties, enables ships to pass through the dam in about two and a half hours via the 6.44-km-long dock on the northern bank of the Yangtze River. 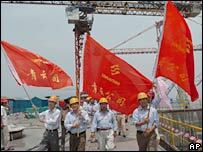 The construction of the Three Gorges Project, the world's biggest hydro-electric project, began in 1993 and is expected to be completed in 2009. The world witnessed on Monday morning the trial navigation of the permanent two-way five-step ship lock of the Three Gorges Dam. With the lock in operation, ships will be able to pass through the dam in about two and a half hours via the 6.44-km-long dock. By 10 pm June 10, the water level of the Three Gorges Dam reached originally-planned 135 meters. The dam completed the water storage 5 days ahead of the schedule. The first two power generating units started their trial operations the same day and Yangtze River will resume its navigation on June 15. At 9am, June 1, with the press on the switch, the No.20 sluice gate began to be closed and the Three Gorges Dam started to fill. In 15 days, the water will rise from 100 meters to 135 meters. The storing of the water in the dam is a milestone in the development of the world's largest hydropower project. 3. There is possibility that the anchor is dredged and that the cable is broken off when ships ascend with the rising water. The reservoir will hold the water that reaches 135 meters above the sea level on June 16. Since it is drier when it came into May this year, the water will rise to 98 meters before the locks are closed on June 1 to hold the water. The expert panel of the committee specializing in checking dam projects under the State Council today gives the green light to fill the reservoir of the Three Gorges dam on June 1 as scheduled and agrees that the dam can be open to navigation on June 16. From then on, all the ships will sail across the five-stage locks to pass the dam. BBC News Online - "Three Gorges dam wall completed". 20 May 2006. BBC News Online - " Three Gorges dam's social impact". 20 May 2006. "Three Gorges Dam to be completed nine months ahead of schedule: developer." People's Daily Online: February 05, 2006. Tremblay, Varfalvy, Roehm and Garneau (2005). Greenhouse Gas Emissions - Fluxes and Processes. Springer. ISBN 3-540-23455-1. "China's Mega Dam" (documentary). The Discovery Channel. Broadcast 28 Jan 2006. Topping, Audrey Ronning. Environmental controversy over the Three Gorges Dam. Earth Times News Service. China Hiking Adventures, Inc. http://china-hiking.com/.